Home » Service Manual Catalog » EPSON Service Manuals » InkJet Printers » SM_TX300 I have paid for Reset Key but not received yet. Epson TX300F, BX300F, ME Office 600F, NX300 printers Service Manual New! 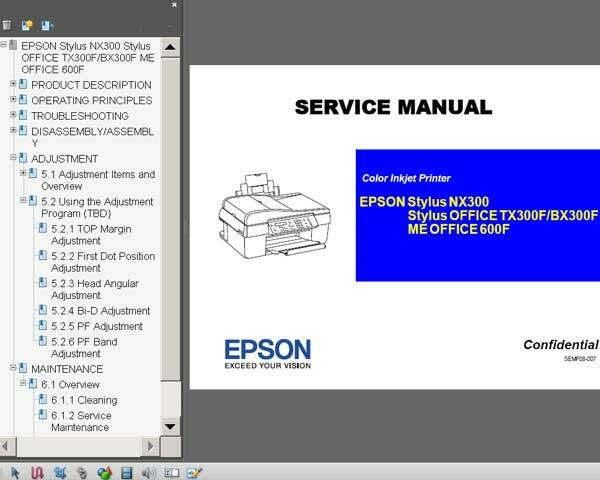 This Epson TX300F, BX300F, ME Office 600F, NX300 Service Manual describes basic functions, theory of electrical and mechanical operations, maintenance and repair procedures of the printer. Semplicemente perfetto, tutto risolto in 2 minuti. I was very pleased with your company and would recomend to everyone. Very easy! Notify me of updates to Epson TX300F, BX300F, ME Office 600F, NX300 printers Service Manual New!